When architect Margherita Thumiger (of London's Studio 29) got a call from an old friend asking for help designing her classic, 20th-century Milanese apartment, Glynn was of course on board. After all, Thumiger has known the client — owner of a concept children's boutique called Mini Ampère — for over three decades and understands her taste, which, unsurprisingly, given her profession, is fun and refined: "She loves fashion, design, and art," Thumiger said. The main goal was to make the home feel family-friendly but still curated and intimate. 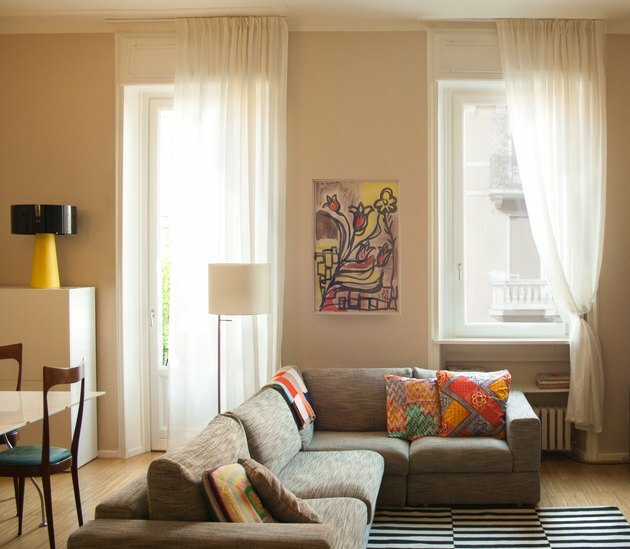 Interwoven throughout the apartment (which is sizable, but not huge, at 1,000 square feet) are family heirlooms, vintage- and retro-inspired pieces, as well as colorful touches that bring just a hint of fantasy. But our favorite space has to be the bedroom of the client's young daughter, which, with its twinkly canopy, is just the type of dream room we wished for as kids. In the living room, a bright yellow chair by Spanish designer Patricia Urquiola provides a pop of color against neutral, beige walls. 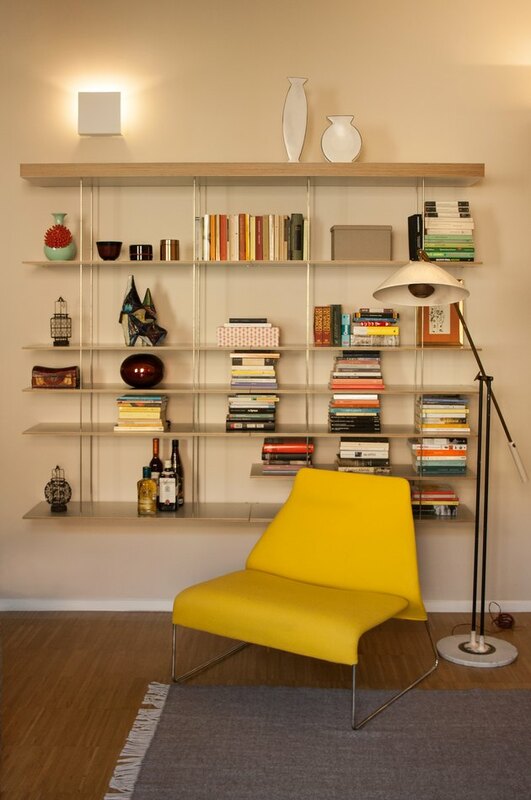 The midcentury lamp turns the corner into a reading nook. In the open living-dining area, a gray couch dotted with pillows covered in African wax cloth acts as a transition between the spaces. The framed art piece is a family heirloom that has been passed down for more than half a century. A Kartell dining table is surrounded by vintage chairs scored from eBay, which were reupholstered in turquoise velvet. 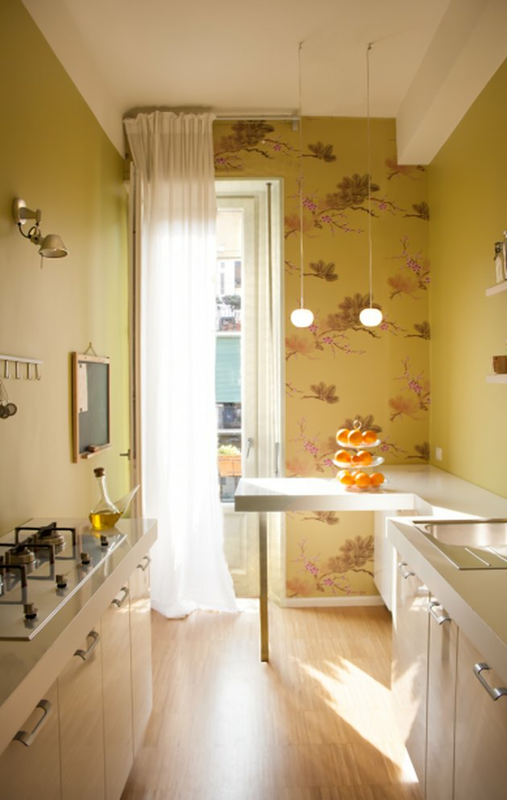 The modern wall sconce (La Lollo Lamp by Slamp) provides a fun contrast to the apartment's traditional ceiling moulding. 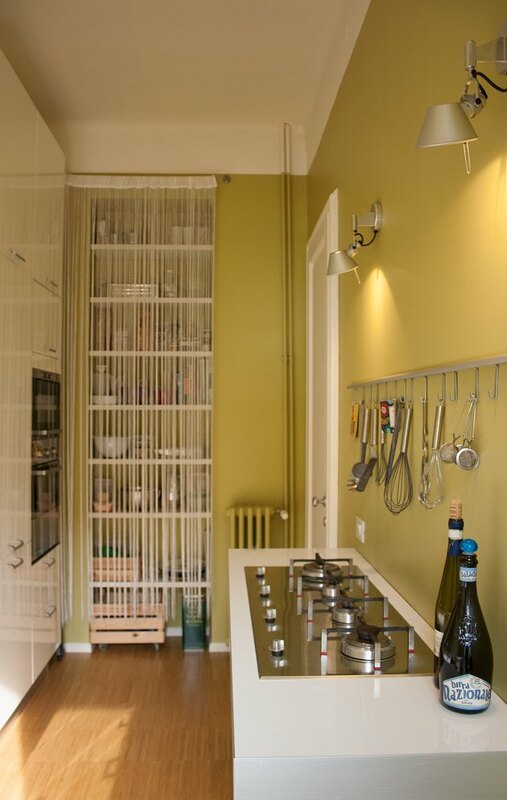 In the kitchen, the team decided to go bold with a greenish-yellow paint that borders on puce. But thanks to the clean, white built-ins and matching wallpaper, the hue is anything but outdated. The kitchen is very much about a vintage vibe with its paint color, Smeg stovetop, and tasseled curtain — which is the type of forgotten retro touch we've been hoping would make a comeback. 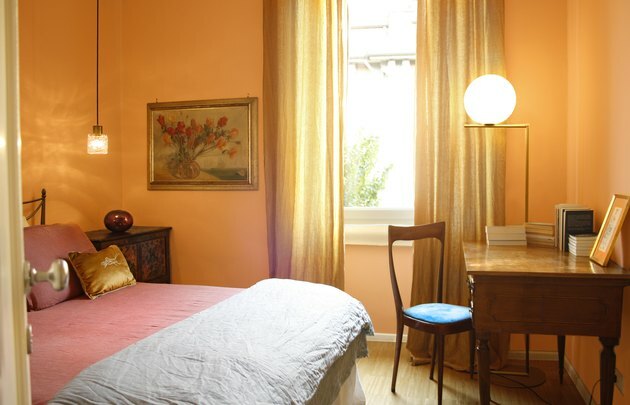 Almost all of the items in the bedroom are meaningful to the clients: The bed was bought at an antique market in Torino, the side table was purchased and used since the beginning of the clients' marriage, and the art was passed down through family. 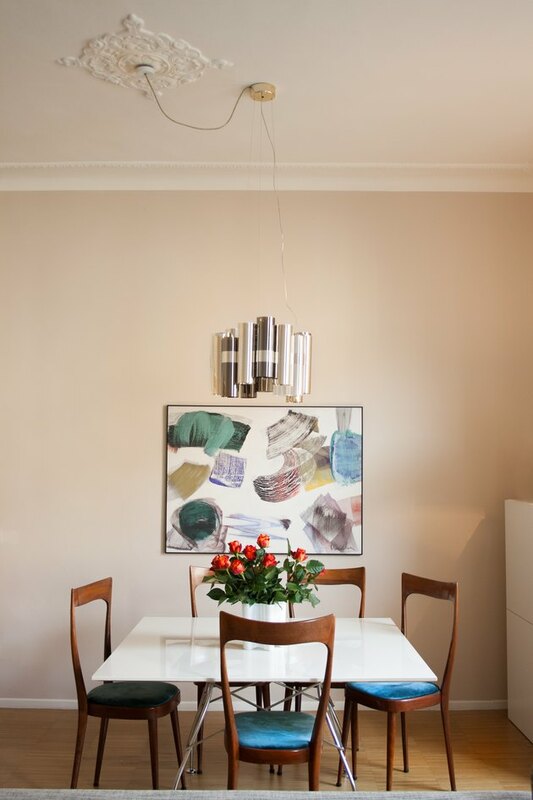 A vintage cut glass hanging light, dismantled from a chandelier, brings an unexpected touch of minimalism to the room. 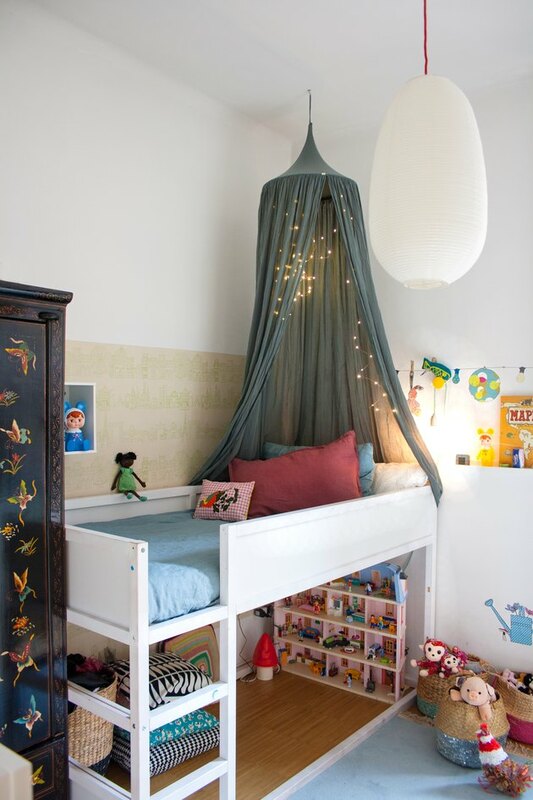 In the kid's bedroom, a loft bed from Ikea is accessorized with an Ikea hanging net (are you running to your local Big Blue Box yet?). A Chinese paper lantern offers soft illumination, perfect for creating a dreamy lighting scheme. Heirlooms are clearly the running theme throughout the apartment. 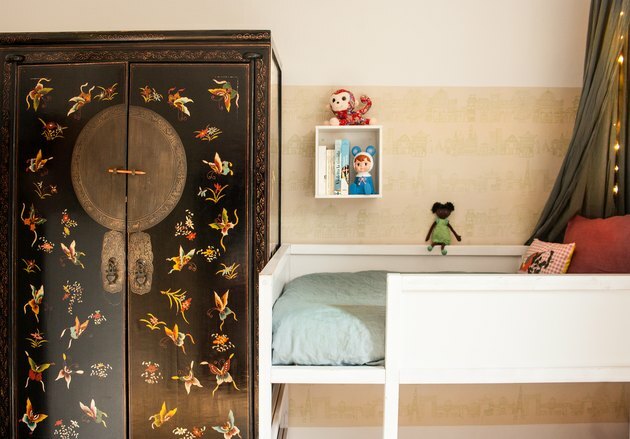 And while this dresser, purchased in Shanghai, hasn't been in the family for long, it's the type of piece that will be passed down for generations.